Although it is not a compact handset, the new ZTE Nubia Z18 also carries the "Mini" attribute. This 5.7-inch handset is powered by the Snapdragon 660 processor, next to 6 GB RAM, as well as 64 GB or 128 GB internal storage. Sadly, it is only available in China for now, where it can be acquired for the equivalent of US$285 or US$335 (depending on the amount of storage). ZTE/Nubia fans who were waiting for a compact handset should not cheer yet, because the new ZTE Nubia Z18 Mini is not exactly an easily pocketable handset. However, the ZTE Nubia Z18 Mini comes with a strong set of features and is quite competitively priced, so the only problem for those who can overlook the device's dimensions of 5.83 x 2.78 x 0.3 inches remains its availability — sadly, this handset can only be acquired in China. The ZTE Nubia Z18 Mini has a Qualcomm Snapdragon 660 processor inside, next to 6 GB memory, 64 GB or 128 GB internal storage space, a selfie shooter with 8 MP and f/2.0, as well as a dual camera setup on the back that brings together a 24 MP f/1.7 sensor and a 5 MP image snapper. Unlike most mid-rangers available nowadays, the ZTE Nubia Z18 Mini comes with a dedicated hardware button that brings forward various AI features. The AI system designed by ZTE is called NeoSmart and we will probably hear more about it once the ZTE Nubia Z18 Mini or another similar handset becomes available internationally. The NeoSmart AI system is a part of ZTE's custom MiFavor UI firmware, which is based on Android Oreo. In addition to the above, we should mention the five color options available for the ZTE Nubia Z18 Mini: white, black, light blue, pink, and purple. Out of the five, the purple option is apparently a bit more expensive than the other ones. 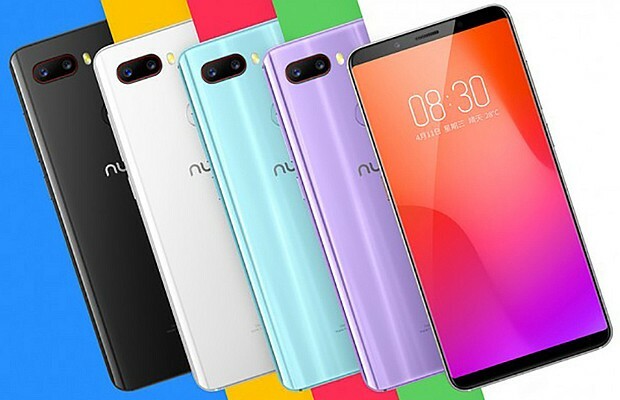 Otherwise, the ZTE Nubia Z18 Mini can be acquired for CN¥1,799 (around US$286) or CN¥2,099 (about US$334), depending on the storage option chosen. For now, there is no word about the international availability of this handset, but we will get back to it as soon as we hear anything new about it. Considering its specs and features, the ZTE Nubia Z18 Mini can become another excellent choice in the higher zone of the mid-range sector. Would you consider grabbing one, or is it a better idea for ZTE to keep it in China?